Game description: A new world of magic, adventure, exploration, and discovery awaits you in Jak & Daxter: The Precursor Legacy. A magical substance called Dark Eco transforms Daxter into a furry Ottsel, so Jak and his rodent friend Daxter go on a journey to look for a cure. You'll solve puzzles, collect power cells, meet exotic characters, and battle sinister enemies in enormous vistas. Discover the story behind the mysterious Eco and unleash the hero within. 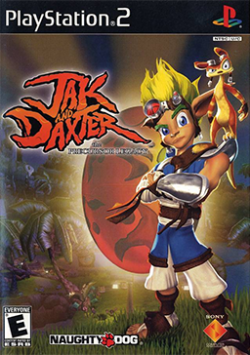 The game follows the protagonist, Jak, as he tries to help his friend, Daxter, after Daxter transforms into an ottsel (a fictional hybrid of otter and weasel). With the help of Samos the Sage, the pair learn that they must save their world from the antagonists Gol and Maia, who plan to flood it with Dark Eco. The game offers a large range of missions and minigames as well as puzzles and platform elements that the player must complete to proceed. Runs a bit slow., Various minor graphics issues (missing textures and shadowing). Fixed somewhat in software mode. Description: There are misplaced shadows coming off of characters at certain angles, usually during cutscenes. Description: Jak, Daxter, and most other characters have "glitchy" eyes, aka a black hole where the eye is supposed to be. Workaround: Set the Renderer in GSdx to any of the Software modes. Description: Characters have weird shadows and odd colors. Workaround: Issue fixed as of September 9th, 2016 git builds. CRC hacks were added for Jak games. To enable it go to Config -> Video (GS) -> Plugin Settings, set the Renderer to "OpenGL (Hardware)" and set the Blending Unit Accuracy to "Basic" or higher. For older versions use the Alpha hack in GSdx Configure Hacks menu or set VU Cycle Stealing to 1 in Config -> Emulation Settings -> Speedhacks tab.